Backlog of cases has become a big problem for the judiciary — from the Supreme Court to the subordinate courts. At the current speed, the lower courts, may take 124 years for clearing 2.5 lakh cases. 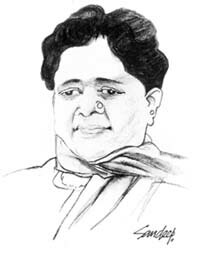 WHen Mayawati became the Uttar Pradesh Chief Minister in June 1995, the then Prime Minister, P.V. Narasimha Rao, described the event as a “miracle of democracy”. That was for the first time that a Dalit woman had become the chief executive of the most populous and politically sensitive state of the Union. India has achieved unprecedented GDP growth rate of 9.2 per cent. The Eleventh Plan Approach Paper aims at a sustainable growth trajectory of 10 per cent by 2012. The objectives are to achieve both higher and faster growth. Ever since the constitution of the present Haryana Legislative Assembly in March 2005, the House has no Leader of Opposition. The reason: No Opposition party has at least 10 members in the House. Prof Manjit Singh Kang has taken over as the Vice-Chancellor of Punjab Agricultural University, Ludhiana, at a crucial time of changed agro-economic conditions and fund shortage. In the last seven years, the disposal rate has increased by 48 per cent in the high courts and by 28 per cent in the subordinate courts, but the pendency has increased. Thus, it is the system (and not the judges) which is at fault. Unless the disposal rate improves, the backlog will keep mounting. To make rule of law a reality, the arrears will have to be reduced. Speedy justice is an assurance extended to a citizen under the right to life guaranteed by the Constitution. Right to speedy trial is an important right in the UK and US. The Sixth Amendment to the US Constitution guarantees all persons accused of criminal wrongdoing the right to a speedy trial. The US had enacted the Speedy Trial Act of 1974 which had fixed standard time requirements for timely prosecution and disposal of criminal cases in district courts. In 1990, the US Congress enacted another legislation that directs each district court to devise and adopt a civil expense and delay reduction plan. Similar laws need to be enacted in India. While new cases in the high courts exceeded 16 lakh cases in 2006, the disposal rate was 15 lakh. Thus, new cases exceeded the actual disposal of cases. For the first time in past eight years, disposal of criminal cases by high courts exceeded. Pendency in subordinate courts had increased from 2.04 lakh in 1999 to 2.57 lakh in 2005. In 2006, the figure has slightly come down to 2.49 lakh. In all, 40,243 cases are pending in the Supreme Court as on Jan 31, 2007. The executive and the judiciary have taken many corrective measures for speedy disposal of cases. The Centre has been extending the judge strength from time to time, but not to the extent of the recommendations of the Law Commission. Due to these efforts, the disposal rate has risen by 48 per cent in the high courts and by 28 per cent in the subordinate courts. But then, pendency has also increased due to more fresh filing of cases. Delay is an issue in the US courts too, but it is not to the extent of decades as in India. In the US, numerous reasons for delay have been assigned most of which are outside a court’s control. Judges have many duties. In addition to trial, judges conduct sentencing, pretrial conferences, settlement conferences, motion hearings, write orders and opinions, and consider other court matters both in the courtroom and in their chambers. Attorneys and/or litigants may be responsible for delays. Cases may be delayed because settlement negotiations are in progress. Some courts also experience shortage of judges or available courtrooms. The number of judges in a court is decided by dividing the average institution of main cases during the last five years by the national average, or the average rate of disposal of main cases per judge per year in that high court, whichever is higher. The ratio of judges per million population in this country is the lowest in the world. The population and judges ratio in India is 13.5 judges per 10 lakh people as compared to 135 to 150 per 10 lakh people in advanced countries. The ratio of judges per million of population is about 58 judges in Australia, 75 in Canada, 51 in the UK and 107 in the US. Due to this low judge-population ratio, the courts are lacking requisite strength of judges to decide the cases. 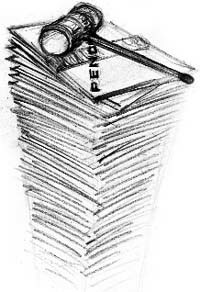 The average disposal per judge is about 1300 cases in subordinate courts if calculated on the basis of disposal and working strength of judges in 2006. The average disposal of all Indian high courts is about 2400 cases per year. The national average of disposal of cases per judge per year in major high courts is: Kerala, 3,103; Madras, 2,979; Calcutta, 2,919; Punjab and Haryana, 2,900; Karnataka 2,817 and Andhra Pradesh, 2,625. The national Indian average is 188 cases disposed of among 21 high courts everyday. The Madras High Court leads in terms of speedy disposal of 648 cases, on an average, each day. Tamil Nadu is followed by Uttar Pradesh where the Allahabad High Court (Lucknow and Kanpur benches put together) dispose of 445 cases everyday. Applying the national average of 2400 cases per judge per year, the time for disposal of backlog of cases can be calculated by any one. The Punjab and Haryana High Court had been successful in increasing the disposal of cases due to special efforts of the judges. The average disposal of cases in this High Court is 2900 as against the national average of 2400 per year. The number of cases pending in this High Court is around 2.60 lakh and old cases over the age of two years are 1.70 lakh. In the same period, the number of pending cases in the subordinate courts is around 11.8 lakh. This means on an average every thirteenth person of Punjab and Haryana is affected by litigation. Plaintiffs in most European courts must also pay the legal costs for the defendant if they lose the case. This ‘loser pays costs system’, which is in vogue in nearly every common law jurisdiction outside the US, cuts down on many cases without merit by forcing a claimant to hesitate before filing a questionable lawsuit. But the litigation cost in terms of court fee and award of costs is very low in India and this is the main reason for frivolous litigation. The advocate fee and other costs have increased many times in the last 50 years, but the court fee is hardly realistic to generate more revenue for creating infrastructure and appointing more judges to strengthen the legal system. There was a time in India when in all civil proceedings costs were invariably awarded or reasons for not awarding costs were given. But nowadays costs are rarely awarded. The inadequate judge strength, low court fee and not awarding costs against the loser resulting in frivolous litigation are three major causes of delay in the disposal of cases. Owing to the shortage of judges, even if judges work beyond their normal capacity, the arrears are bound to increase. The total number of judges is not adequate to clear the backlog of cases. It is not possible even to dispose of the actual fresh institution. Clearly, the backlog cannot be cleared without additional strength. To tackle the problem of backlog within a timeframe, we need to allocate additional funds for employing additional judges. Later, as the backlog comes down, these judges would be crucial in keeping the fast pace of the judicial system. However, Delhi-centric opinion makers ridiculed Rao’s remarks as cynical. Her hostility towards upper castes, little respect for ideologies, conventions, niceties or decency and uncouth manners drew scorn. Her hostility towards upper castes was attributed to hard knocks of life in young age when she was a student. The scorn of higher caste students during her college days might have turned her into a rebel and a fighter. Having graduated from the Delhi University, she qualified for a Law degree. Later, she did B.Ed from the Merrut University. Compare Mayawati of 1995 to Mayawati of 2007as she begins her fourth term as the Chief Minister of the most populous state. This time she is on her own strength and does not need support of any political party. Gone is the hatred for the upper class. With Dalits firmly on her side and Brahmins no longer wary of courting her, she also earned the support of Muslims and other upper castes which comfortably took the BSP to the majority mark. No party in UP has been able to win a majority since the BJP got 221 seats in the 1991 Assembly elections. That was the time when Ayodhya movement was at its peak. What Mayawati achieved through her social engineering now is indeed yet another “miracle of democracy”. Mayawati’s entry in Parliament 19 years back was also not without disappointment. She had lost two by-elections to the Lok Sabha from Bijnor (1985) and Hardwar (1987). Anyone else in her place would have given up. But she was tenacious enough to contest for the third time from Bijnor and entered the Lok Sabha in 1988. She was new to Parliament and was not conversant with rules and regulations. What impressed her was the practice of some Opposition members to rush to the well of the House when the issues raised by them were disallowed by the Speaker and often “gheraoed” the Speaker's podium. Even at the slightest provocation, she would rush to the Speaker’s podium. Nevertheless, she was quite inquisitive about parliamentary practices and keen to learn. Instead of giving her an opportunity to know the rules, she became an object of ridicule. Certain women members belonging to princely houses did not like a sweating Mayawati and requested a senior MP to advise the BSP member to use perfume. Her meeting with Kanshi Ram changed the course of her life. It was in 1984 - the year of Indira Gandhi’s assassination - that Mayawati met, for the first time, her future mentor. She was teaching in one of Delhi Administration-run primary schools. Perhaps, her aggressiveness impressed the little known Kanshi Ram then and both developed an instantaneous rapport. Gradually, Kanshi Ram came close to her family. Mayawati’s house in the J.J. Colony — a lower middle class complex — in Delhi’s Inderpuri area was for years decorated with two huge framed pictures of Kanshi Ram. Years of fight for a cause, which both Mayawati and Kanshi Ram believed was right brought them very close. Mayawati worked with the zeal of a crusader among the backwards and emerged as their champion. She was greatly influenced by the thinking of Baba Saheb Ambedkar and ideas of Kanshi Ram. However, she realised later that she could not make a headway without the support of “forwards”, along with the Scheduled Castes and Muslims. She heavily relied on three persons in chalking out a poll strategy and they are now her trusted lieutenants. A key member of the trio, Satish Chandra Mishra, ironically, a Brahmin, and a former Advocate-General, is credited with the innovative alliance of Dalits and Brahmins. 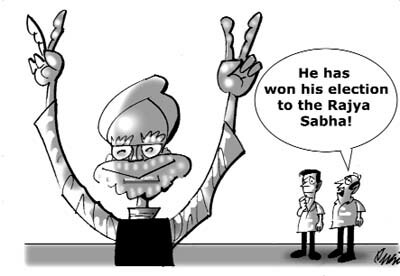 The second is two-term Rajya Sabha member, Gandhi Azad. He is said to be the eyes and ears of Behanji. The third, Nasimulddin Siddique, a Muslim leader of Faizabad, is an able organiser. Whenever Mayawati needs anything to be organised, she turns to Siddique. Apparently, Mayawati’s elderly father, Prabhu Dayal, did not believe in family planning. He produced three daughters and six sons and Mayawati is the second child. All her brothers and sisters are happily married and settled. Like her mentor, she also decided to remain unmarried. Times have vastly changed since then. Mayawati has now emerged as a powerful new generation leader with her own support base. Our magistrates need to be educated about the Supreme Court ruling that vulgarity is not synonymous with obscenity…The real problem lies in the irresistible urge of the complaining lawyers and judges for publicity and the pleasure of observing attractive celebrities at close quarters and cross-examining them. I am close to the people of Gloucester and I look forward to serving them even better as Mayor. There have been 526 mayors and it has taken a long time to see a Mayor from an ethnic minority. I am immune to the seduction of power. My aim is to put Germany back on its feet again. At the same time, I will try to carry on living a normal life cooking potato soup and plum cake. Adversity often teaches you things that you otherwise wouldn’t learn…Like the saying goes — a bend on the road doesn’t mean the end of the road. I want more people to appreciate this thought. I was not a pretty child and was nick named ‘Bugsy’ because I had buckteeth. I still have buckteeth, but then I was only like 70 pounds, so they really stood out. I never got braces because I am okay with my imperfections. In fact, I like to accentuate my buckteeth when I smile. I just have a big old smile. Happiness is the lucky pane of glass you carry in your head. It takes all your cunning just to hang on to it, and once it’s smashed you have to move into a different sort of life. I want to join politics because the situation in Nepal is such that it is not right to sit mum. I would have been glad to remain an actress if everything in Nepal was fine. I can’t shirk my responsibility. Tailpiece: My ideal man has to be taller than me, at least six feet. I want him to like me for who I am and not Sania Mirza, the brand. An ideal man is really hard to find, especially for a successful woman. One has to keep so many factors in mind and it is difficult to choose from a long list of people. India has achieved unprecedented GDP growth rate of 9.2 per cent. The Eleventh Plan Approach Paper aims at a sustainable growth trajectory of 10 per cent by 2012. The objectives are to achieve both higher and faster growth. The overall performance so far has been commendable. But have we achieved our potential? The answer, unambiguously, is No. Some factors hindering the potential are outside the economy managers’ control, but there is scope to perform better. One factor the policymakers have consistently failed to address is gender bias. This has resulted in huge, unaffordable economic costs to the country. According to an UN-ESCAP study, the lapse is so enormous that it would fall in the category of “economic crimes committed against the country”. The ESCAP-2007 Economic and Social Survey report presents an analysis of economic costs of gender bias for the Asia-Pacific region including India whose performance leaves much to be desired. The ESCAP survey pinpoints two sectors that are major input triggers for GDP growth. One, restricting female labour force participation rate — not physical, or legal restriction, but sheer thoughtless indifference by economic governance. And two, neglecting women and girls’ access to education thereby drawing down the country’s potential human capital. Since there is very superficial, minimalist, interface and dialogue between the leaderships of policy institutions and grassroots development practitioners, these known economic costs could not be communicated or factored. The gap, captured by ESCAP, should have been captured by our institutional development mechanisms. Let’s view the statistical economic loss profile. The ESCAP study presents two different scenarios for estimating the economic costs of gender bias. The first uses a benchmark, which is the female labour force participation in the US at 86 per cent — highest among OECD countries. If India’s female labour force participation were to increase to the benchmark level, its GDP growth would increase by 1.08 per cent per year. In value terms, that would translate into $19.00 billion per year. We, as a country, have lost billions of dollars every year since 1947 and the losses have escalated with increasing GDP rates. The second estimation is based on women’s labour force in India increasing by a mere 10 per cent (permanently). The impact would then be an additional GDP growth of 0.31 percentage points and in value terms it would be $ 5.4 billion per year. Both these estimates reveal the huge quantum of losses India has incurred due to discriminatory gender practices. No such estimates have ever been attempted though India has some of the world’s best brains in policy, econometrics and statistical areas. As the correlation between mindsets and economic costs has not been understood, India has been suffering losses of wealth creation. It is not only the women but India has been marginalised. The cross-country gender gap index of ESCAP of economic participation and opportunity ranks India among the 25 worst performing nations with even Bangladesh, Sri Lanka, Nepal, Cambodia, Indonesia etc. ahead of us. It is a well recognised truism that economic growth depends on human capital and education. Take the case of US where more than two-thirds of output growth over the last 40 years has come from labour productivity increases and education has contributed 13-30 per cent of this growth. Should we have figured out our costs? Narrowing and eliminating the gender gap is possible. Philippines has done it; it is sixth in the global index of female workforce participation opportunity and education attainment. Its success reflects the government policies in the last two decades which made gender part of national development long before it became an international norm. India could gain by closing the gender-gap and achieving higher growth than China which has already used that advantage to a large extent. The leadership could mandate “no-gender discrimination” at policy formation level with focus on female workforce participation and on women’s education and technical skills training for enhanced employability. Concurrently, empowering initiatives need to be undertaken on closing the gender gap coupled with a “pro-active equal opportunities policy” in the demand driven areas of the economy. Secondly, let there be a stated transparent “credible basis” enabling Five Year Plans to be gender inclusive. Evolving a Gender Discrimination Index will ensure Plans serve equitable interests. Thirdly, there needs to be a shift to integrated, cohesive development policy and plans with measurable targets and timelines replacing the existing fragmented, knee-jerk, policy-less approaches. Fourthly, the government must provide for permanent institutional frameworks for development of women that are tasked to ensure elimination of gender discrimination in policies, plans and programmes. A clearance from this mechanism should be made compulsory. An accountability mechanism which serves as a regulatory body is also a must. And finally, gender discrimination tendencies of the leadership and administrators must entail personal career costs. A system can be worked out by the relevant ministry. Mindset change is key to this whole process and medieval, feudal thinking has to be weeded out. We can bring this much-needed change. We broke new ground in 1991. We can confront this challenge too. The Eleventh Plan is timely and best positioned to begin the change to provide the required leadership. We await a new morning. The Leader of Opposition’s post is only legislative in nature. It was recognised first in 1969 when the Congress split. The post got statutory recognition in Parliament after The Salary and Allowances of Leader of Opposition in Parliament Act, 1977, was enacted. This Act accords the status and rank of Cabinet Minister to the Leader of Opposition in the House. In Haryana, however, the Leader of Opposition post is neither governed by any statute nor it finds mention in the rules of procedure and conduct of business in the State Assembly. It is the Speaker who accords the status of Leader of Opposition in exercise of the residuary powers vested in him. According to parliamentary conventions, the leader of an opposition party is recognised as Leader of Opposition if the party has at least 10 members or one-tenth of the total membership of the House to constitute the quorum under Article 189 (3) of the Constitution. In the 90-member Haryana Assembly, the quorum for a sitting of the House is 10 members including the Speaker or the Presiding Officer who is an integral part of the quorum. Interestingly, both the Speaker and Deputy Speaker belong to the Congress. Thus, an opposition party with nine members in the House would also constitute the quorum with the Speaker or Deputy Speaker in the Chair. The requirement of quorum is only for the smooth functioning of the House. As the Indian National Lok Dal has nine members, it is entitled to be recognised as the official opposition party and its leader as the Leader of Opposition. The 1977 Act inter alia provides that if the tally of two or more parties in opposition is same, the Presiding Officer, having regard to the status of the parties, recognises any party as official opposition party. Though the provisions of the Act do not apply to the Haryana Assembly, the status of a political party should play a persuasive, if not substantial, role in according the status of official opposition party in Haryana. Today, the Leader of Opposition has assumed much significance as he is included in the committees for selection and appointment of such key functionaries as the Director-General of Police, State Security Commission (vide the Supreme Court’s Sept 11, 2006 directive on police reforms), Lokayukta, State Information Commissioner, State Election Commissioner etc. Even otherwise, the government ought to consult him before finalising appointments to key posts. In certain enactments such as the Right to Information Act, 2005, it is provided that if there is no recognised Leader of Opposition, the leader of the largest legislative party shall be deemed to be the Leader of Opposition for the purposes of the Act. This makes a strong case for recognising the leader of the largest legislative party in opposition as the Leader of Opposition. Prof Manjit Singh Kang has taken over as the Vice-Chancellor of Punjab Agricultural University, Ludhiana, at a crucial time of changed agro-economic conditions and fund shortage. Till recently Professor of Quantitative Genetics at Louisiana State University, USA, he says that the PAU has a tremendous potential to boost farm growth. In an interview to The Sunday Tribune, Dr Kang talks about his vision, resource mobilisation and the much-talked about political interference that cost his predecessor, Dr K.S. Aulakh, his job. “I joined PAU with a vision to place it among the world’s top 10 agricultural universities in five years”, he avers. Q: What prompted you to take over as the PAU VC after spending much of your time in the US and having got the US citizenship? A: This is home coming. I returned to PAU after four decades. I have done my graduation here. For achieving great success, one need not go abroad; it can be done here itself. A: I should bring PAU to the highest possible achievement. I have fixed a five-year target to make PAU one of the world’s top 10 agricultural universities. It is already the country’s best agricultural university. Q: How do your realise this vision when it is felt that research has come to a standstill and no new varieties of crops are coming out? A: Research has not come to a halt. It is a misplaced notion. Several research projects are already in the pipeline. They take time to complete. It may not be at the same pace as it was earlier. There are no magic solutions to certain problems. Q: Don’t you have sufficient funds to pay employees’ salaries? A. Resources is a major problem. But I am confident that people who run the institution will take care of this aspect. Funds should not be a major problem any longer. About the accumulated deficit, there is no other way out but the one-time grant by the government. Q: The traditional agriculture is no longer considered viable. Is diversification the only way out? A. I think the wheat-paddy cycle has given the best results for Punjab and will continue to. But we need to explore other economically more remunerative options. These can be taken up in a gradual manner. We can’t make an instant or overnight shift. We need to lay more emphasis on biotechnology, genetics and plant breeding. And PAU’s plant breeding centre is found to be one of the best with a huge potential to deliver phenomenal results. Q: Can we continue with paddy with the fast depletion of the water table in the state? A: This is a major problem. Growing paddy is not the sole reason for it. Like global warming, there are many reasons. Water table is falling due to many reasons. But we can take some corrective measures like ensuring that paddy is not transplanted before June 20 and regulated and proper use of water. Q: There is an ugly trend of political or government interference in the functioning of universities in Punjab. How do you look at it? A: I am a firm believer in the autonomy of universities. I am sure, people who brought me here want to run the institution and not interfere with it. At the same time, I am aware we are financed by the state government and we have to depend fully on them. Once we adopt a positive approach, not many problems will arise. Moreover, what may be a friendly advice for some might be construed as interference by others. But I don’t owe any obligation to anyone and if there is any interference, I will tell you (smiling). Because I am frank and candid enough to tell the truth. Q: Is there any difference in work culture here and in the US? A: Certainly. But the bottomline remains the same. Because it is primarily the research that is carried out here and there. However, there is difference in approach. One cannot say that one is good and the other is bad. There are so many factors that need to be taken note of before passing judgements. Q: Do you expect any foreign collaborations? A: I do hope people will come forward. First there is Punjabi diaspora and also those who are settled in different parts of the globe and are keen to help. Even the people from the US are willing to provide help in different ways. Give me sometime and the results would be before us to assess.